Another busy week! New animation: Tales of Zale - Minisode 3, Daily First Place Award for last week's Tales of Zale - Minisode 2 on Newgrounds, 3 Little Raptors reaches a whopping 4,000,000 Views on YouTube + even more videos! It's been another busy week in Post-production for JabunAudio, and the hype train is surely steaming ahead for Hikarian's Tales of Zale - Episode 2 coming out next week! Lots of news and videos to share in the mean time so let's get right to it! Firstly, the main focus of this week has been doing the sound mixing for the latest Hikarian animation for Tales of Zale Month: Tales of Zale - Minisode 3, which was guest animated by Dylan Carter, features Andy Thomson doing the sound design and Mathew Pablo doing the music again, and of course sees the return of the lovely smooth voiced Edwyn Tiong reprising his role as the mysterious Morpheus (the black cat)! It was great fun working on this one and I'm super hyped to continue working on Episode 2, which comes out next week! It's going to be one heck of a ride so be sure to stay tuned for the Tales of Zale Month Finale on April 28th! In the mean time, keep your animation hunger going with our latest addition to the Tales of Zale universe: Minisode 3! Get hyped! Continuing on the topic of Tales of Zale, last week's Minisode 2 took Newgrounds by storm and was awarded the lovely Daily First Place award! This'll be the first time a project I've worked on has received this honour, with a few past projects narrowly missing the spot and earning Daily 2nd or 3rd place (still much appreciated). Thanks so much Newgrounds for the support and we hope to wow you with this week's minisode as well as next week's Episode 2! Finally this week, another track from Two Years On, and another Orchestral commission are up on YouTube for your streaming pleasure! This week from Better Than The Book, we have the short interlude track 09: "Re: HipHopPunk" featuring the wonderful Bob Axell (AKA Cyberdevil) on vocals, and for orchestral commissions, we have "Chin Up" from the 1973 Charlotte's Web Animation. Hope you enjoy them, and stay tuned for next week's videos! That's about it for this week but next week is set to be a super busy one working on the grand Tales of Zale Month Finale: Episode 2, which comes out on Thursday! I think that'll probably take up most of my week, so I'm not sure what else will be going on, but stay tuned for that and more on the JabunAudio Facebook Page and in next week's update! In the mean time, hope you're getting hyped for Tales of Zale - Episode 2 and thanks as always for all the support! Take care everyone and see you next week with lots more to share! A Super Exciting Week + Lots of Videos! New Animation: "Tales of Zale -Minisode 2", Livestreaming with Hikarian Animations, Meeting lots of cool people at Brighton Music Conference 2016, Better Than The Book receives Front Page on Newgrounds, + more! What an eventful week! Lots of new experiences, meeting amazing people and videos to share! I've no idea how to introduce it all, so lets get right to it! Following on with the Tales of Zale theme, I was also invited to take part in a YouTube Livestream with some of the Tales of Zale crew on Friday evening, which was a whole lot of fun! It was actually my first time involved with a Livestream and one heck of an experience! Crazy to think too, I've been involved with Tales of Zale for well over a year, but I hadn't even met half the people who've worked on it. As the sound mixer too, I generally only get to communicate with the director and the sound designer, and this is mostly through text, so it was amazing to finally hear everyone's voices and chat with some of the crew about what we do as well as interact with the fans. The livestream featured Sif, Victor, Nate and myself, talking about what we do, answering fan questions, talking about icecream flavours, trying to invite President Obama to join us, Batman and more (It's best just to watch and see... I really can't begin to explain that!). Feel free to check out the stream below and even join some more of the crew for the next one! Hikarian is hosting a live stream every Friday in April at 7pm DST on her YouTube Channel, and it's a great place to meet the crew, ask questions and generally have a fun time! I'll not be there next week (22nd) but I aim to make it for the last Tales of Zale Month Livestream on the 29th! Also, Victor (AKA TheSilleGuy) Drew this great picture to represent our time that evening! For a full explanation of what's going on, you'll have to check out the livestream above, but if it's not clear, I am the melting cookie dough flavoured ice cream second from the right! Check out more of Victor's work on his YouTube Channel and Twitter. Looking forward to seeing you again Victor! Next on the interesting things that happened this week, after Thursday's animation release, I decided to take some time out to attend Brighton Music Conference 2016 and it was GLORIOUS! It was my first time at this specific conference and on top of the usual playing on and listening to lots of cool new gear (it's focused on electronic music producers), I met a ton of cool people (some old and some new)! First was Luke from Korg who I've met before a few years back when he came to demonstrate some new synthesizers at my local music shop GAK (out of the 4 which were demonstrated that day, one of which I now own, and 2 others of which my brother now owns! ), and had a talk with on Korg's latest gear as well as more music tech geekery! 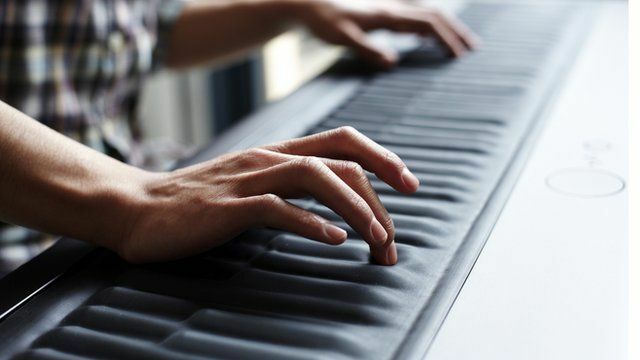 Next was Gerald, product specialist for an amazing piece of kit called the ROLI Seaboard, which is kind of like playing a keyboard crossed with a squid?! Feel free to look up what I mean (it's amazingly strange, and strangely amazing! ), but boy could this guy play! The amount of expression and realism he could convey with this kit especially with orchestral sounds (fading to choirs!) was astonishing and beautiful! Definitely something I'll have to keep an eye on! On top of more awesome people from Moog (who I discussed modifications with) and Yamaha (more on that later), I also bumped into Markus Fuller, a popular YouTuber who dismantles and explains musical equipment in his videos who I'm a big fan of and have been watching for a long time! Terrific and friendly guy and I ended up chatting and hanging out with him and another musical YouTuber, Organaut (great organ/keyboard player), and going to Yamaha's product launch for their new Flagship Synthesizer: The Montage (which Markus already had on order to dismantle in a new video!). The Launch performance also included Matt Johnson of Jamiroquai, who shredded the keys outstandingly and was awesome to chat to afterwards too! The final big presentation I stayed for was on "The Rise of Synthesizers" by Doctor Mix which was great fun, starting with an amazing Theremin Solo (one of the first electronic synthesizers, and this one was signed by Bob Moog too!) accompanied by some modern Yamaha Synths, then went onto the basics of Analogue and Digital synthesis which was very interesting (and the jams were great!). I had a great conversation with one of the Doctor Mix presenters afterwards which was awesome, though unfortunately I didn't get to speak to Claudio himself. All in all a fantastic Day out, though one major lesson learned: I really need to remember next time to bring some business cards! If you're interested in more of the day's goings-on, Markus Fuller has already put up a video of his highlights of the day and if you look carefully, you'll be able to spot me chatting with him before the Yamaha Presentation at 3:53 (Grey jumper)! It was great meeting you Markus! Boy this is becoming a long post, but we're not quite done yet! This week, Better Than The Book made a nice mark on Newgrounds as "Hearts Racing" was featured on the front page! This isn't the first time I've made it onto Newground's front page, but it is a first for Better Than The Book which is very nice :D Many thanks Newgrounds and I'm really happy you like the music! Lastly, as usual we have another track from "Two Years On", and another track from the Charlotte's Web orchestral commissions streaming too. This week it's "Wireless Networks Available" on the BTTB YouTube Channel, and "Charlotte's Farewell" over the HurpADervish Channel. Hope you enjoy them and feel free to leave comments and subscribe for more videos! More to come next week! I think that's about all I can report this week, but it certainly was a good one! Next week I'll be working hard again on the next 2 Tales of Zale Animations so stay tuned for another one coming out on Thursday! Apart from that I'm not sure what's going on, but I'm sure I'll be busy enough. Until then, I hope you all have great weeks and thanks for taking the time to read, watch and support JabunAudio. Take care and see you next time! "Two Years On" Track by Track Stream on Newgrounds, more YouTube Streaming, Tales of Zale Month's First Animation + more News! Firstly some Better Than The Book news! After receiving a private request from an indie-game maker, "Two Years On" is now streaming track by track on Newgrounds! You can check out the full album playlist here and even leave comments and reviews for the individual tracks now (if you're a member of the wonderful Newgrounds community). The album, as well as the One Small Step EP will eventually be featured as part of the soundtrack for a new online game! No ETA or details yet, but I'll keep you all posted on the game's progress as and when I can. Also, since I was making playlists on Newgrounds anyway, here's a playlist of the entire Better Than The Book Discography if anyone's interested. Enjoy! Next, and continuing with the weekly YouTube updates, we're onto the second half of the "Two Years On" stream, kicking off with Make Your Mark this week on the BTTB YouTube Channel, while over on my other channel, we have the next of the orchestral commissions "I Can Talk" from the 1973 animation Charlotte's Web. Video links are below, so feel free to take a gander and I hope you enjoy them. Keep up to date and informed by subscribing to the relevant channels if you wish. Finally in this week's news, Tales of Zale Month kicked off this week with the first of 4 animations (going live on Thursdays), though due to some production re-scheduling, we had to change the order of release so I'm not actually a part of this particular minisode. Don't fret though, as I'll be working hard for the rest of the month on the next 3 animations, coming out in the next few weeks. I won't post a stream here as it's not my place to, but I highly encourage you to go check out the Tales of Zale Minisode 1 on Hikarian's YouTube Channel here. Great work! That's it for this week. Next time I'll definitely have an animation posted up here, so please stop by next week to check it out. I think Tales of Zale will be my life for the next 3 weeks, so I'm not so sure what else the weeks ahead will have in store. We shall see! Anyways, as always thanks for supporting JabunAudio and take care! See you for some animation fun next week! LOTS of new Videos, more Better Than The Book Radio Play, "Tales of Zale" Month including a LIVE ACTION REMAKE?!? + I got a new sophisticated piece of musical equipment (i.e. : a fun new toy) + more! LOTS has happened in the 2 weeks since the last update, mainly a lot of new videos to share (but some other stuff too)! Hope everyone had a great Easter weekend. Let's get started! And as an extra special start to "Tales of Zale" Month, the long awaited Live Action Remake of Episode 1! APRIL FOOLS!!! But in all seriousness, WOW! I wasn't even in on this! Massive props to Hikarian for managing to pull this off using new footage and the audio I mixed for Episode 1! Great work! Next up are some more tracks from the "Charlotte's Web" Orchestral commission. This week we have "There Must Be Something More" and "Charlotte's Web". Hope you enjoy them and subscribe to keep up to date with new videos as they arrive. There's lots more left to come! That's about it in terms of audio/project news this week, but it's been eventful in other ways too! For instance, I finally purchased a brand new toy for the studio, my first physical instrument purchase since starting up this business (and it's been loooong overdue)! It's a portable recreation of some classic 60s - 70s - 80s electric keyboard instruments and their amplifiers and effects boards: The Yamaha Reface CP. Those of you who know me and/or my music well will know that I am quite the Yamaha fanboy with this being the 6th Yamaha instrument to date (unfortunately, I no longer have the old 70s organ from my teen years, but it is immortalised in one of my first ever recordings from waaaay back then "Free of Routine" (gotta appreciate history, though thankfully I've developed since then!)). Electric pianos were also featured heavily in my first track as released Jabun "Bergamot" in 2012 too, and even before actually getting to play a real Rhodes piano a few years back, I've been in love with that mellow oldschool sound. Originally I stumbled upon this instrument by accident: When the reface series was released back in September 2015 I was hugely interested in the YC combo organ model (I still am), but when I went down to the local music shop to try it out, they only had the CP and CS (Classic synth) models on display. I had a quick go on the CP to see how its general feel would be and instantly fell in love with it! The sounds, the feel, the hands-on no-menu-diving compact interface; I was instantly hooked! Since then every time I've seen it in a music shop on display, I've gone to play it for more than just a little while. I was entranced with every vist! So after a while I figured. I gotta get this, but this was during the final few months of the Two Years On album's production and I though to myself, I really DON'T need any extra distractions. As soon as that was over it was straight into orchestral commissions so I thought the same thing to myself again, but finally last week I had some free-time, some spare pennies, and some business investments to make before the tax year is over, and after all those months of waiting I now have a Yamaha Reface CP sitting on my desk! Expect to hear it in my productions soon! In other other news, it's been an eventful 2 weeks in terms of films and animation and I have been watching intently! Batman V Superman was awesome, definitely on par with Man of Steel, but sad to hear it was not well received by a lot of people... Agreed it had its slow and/or drawn out moments, but the acting, story, music, sound, atmosphere was spectacular. If you haven't seen it, go see it before you make your judgement on it. It was no Fantastic 4 2015 that's for sure (that really wasn't so great...). My bro also got me the soundtrack on vinyl as an early birthday present too which is spectacular! I'm listening to it as I type this. Really looking forward to seeing how the story develops for the other justice league films. On the other spectrum of DC comics, the recent Justice League VS Teen Titans animated film was spectacular! Very well delivered and great to see Raven's origin story especially. A BIG contrast to my usual expectations of the characters in the form of Teen Titans Go! (Brilliant in a completely different way!). Overall I highly recommend for any DC fans out there. Star Wars Rebels, which my brother recently introduced me to, also had its season 2 finale just a few days ago too, which was phenomenal, brutal , ambiguous and left me thinking "Holy **** when is season 3 due to come out?!" Props to everyone involved in that for such a great expansion of the Star Wars Universe I grew up watching (and still do! ), and props to the DC film and animation teams too. It's been a great 2 weeks of film watching and inspiration! And that about rounds things off for this week. The next 4 weeks will undoubtedly be packed full of "Tales of Zale" action so expect a new animation in next week's update (along with the usual video schedule). I am going to be VERY busy this month! I'm dying to make some more of my own music too: something cinematic or electronic or hip hop or a combination of some of those. Hope to be able to fit that at some point! Lots to do, but for now that'll be me signing off. Hope you all have a lovely week and see you in the next update. Thanks as always for reading and supporting JabunAudio and take care!